Choose from thousands of spaces near the Olympic Stadium - including on-street parking, off-street car parks and 397 reservable spaces. The Olympic stadium (or London Stadium as it is officially known) is located in the regenerated East London Queen Elizabeth Olympic Park in Stratford. Driving to the stadium is quite straightforward, with the sweeping A12 and Romford Road from the east running right to the Olympic Park. However, on event days, road closures will be in place so driving close may become quite difficult. Due to the stadium’s location in the Olympic Park, there aren’t many roads in the surrounding area – but on event days, special parking restrictions make on-street parking very difficult anyway. There are a few off-street car parks nearby, but spaces here are also limited. It is worth considering completing the last bit of your journey by public transport. 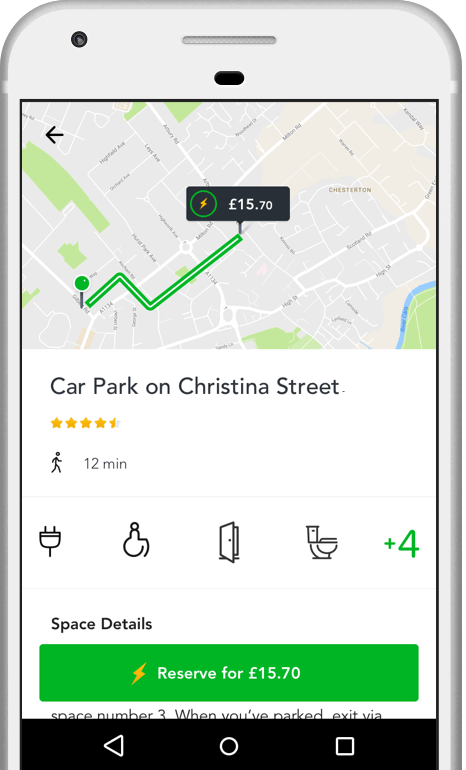 JustPark provides information on plenty of parking spaces near the Olympic Stadium, many of which are reservable – covering both on-street and off-street, from driveways to car parks. On-street parking around the stadium is challenging on any day due to its location within the Olympic Park. However, on event days a special parking zone is in operation – which means that parking is prohibited for all visiting drivers, with the exception of resident permit holders. The area governed by these restrictions on event days is quite large – covering West Ham and Stratford Central, Northwest, Southwest and Southeast zones. These restrictions will apply from 8am-9pm (compared to the usual 8am-6.30pm on non-event days). Parking is limited on all days, as Newham Council have introduced many Residential Parking Zones to ensure residents and business owners have priority when parking – so always be aware of these rules and check signposts so you don’t park illegally. To find information on available on-street parking near the Olympic Stadium, use the JustPark parking map. There is no parking available on-site at the Olympic stadium, and they strongly advise visitors to arrive by public transport. However, there are a few options nearby – albeit with limited spaces on event days. The nearby Stratford International car park (International Way, Stratford, E20 1YY) is primarily a Long Stay car park offering just a daily rate, albeit reasonably priced. The car park is just a short walk away and is open 24 hours a day, Monday-Sunday. Stratford multi-storey car park (Great Eastern Road, Stratford, E15 1BB) is another off-street option which may be more suitable for those wanting to pay hourly. Also open 24 hours a day, Monday-Sunday, this car park is in a good location near to Stratford station. Daily fares here though are very expensive. JustPark offers a wide choice of reservable parking near the Olympic Stadium – in both council and commercially-run car parks, as well as at hotels, offices and on private driveways. You can find and book your space via our website or app. It is recommended by the Olympic stadium and Newham Council to arrive by public transport – and fortunately, there are a number of stations nearby. Stratford International to the north provides High Speed National rail and Docklands Light Railway services, whereas the much larger Stratford station provides the best nearby transport links for the stadium. Stratford station – a very short walk from the Olympic Park – offers London Overground, Dockland Light Railway, National Rail and London Underground services on both the Jubilee and Central lines, all making the stadium incredibly accessible. Limited off-street disabled parking is available to pre-book at the Olympic stadium on event days. Disabled drivers displaying their Blue Badge may also park on-street, on single or double yellow lines, for up to 3 hours if necessary – provided they are not obstructing traffic. Be aware that, on event days, some roads surrounding the stadium will be closed or have loading bans in place for all vehicles. You can filter when searching on JustPark to show all our parking spaces with disabled access around the Olympic stadium (select this option by clicking ‘Filters’ on the search results page). The Olympic stadium is found in the London borough of Newham, who operate a number of Residential Parking Zones. Many on-street spaces surrounding the station are reserved solely for resident permit holders and business owners on all days. However, on event days, a large Controlled Parking Zone comes into effect – prohibiting all on-street parking around the stadium within the Newham borough. It is also worth noting that on event days, Montfichet Road will be closed an hour before and after most events – and the Loop Road around the stadium will be closed altogether on these days. On the JustPark map, we’ll only show you spaces which are not restricted at the times you search for parking. The majority of parking restrictions in off-street car parks and pay-and-display spaces around the station – and in the London borough of Newham – still apply on Bank Holidays and weekends. Overnight parking is available at the nearby Stratford multi-storey car park (E15 1BB) and Stratford International car park (E20 1YY) with both open 24 hours a day. The Olympic stadium is located within the Queen Elizabeth Olympic Park, which helped play host to arguably one of the most memorable Olympic Games. The park itself has helped transform a previously dilapidated area of East London into a beautiful oasis with greens and streams, all overlooked by the modern structures that help remind anyone of the time the world flocked to Stratford. Rated 5 stars with an average satisfaction rating of 96%, JustPark is the UK’s favourite parking service. But don’t just take our word for it – check out some of the latest customer reviews for our Olympic Stadium parking spaces at the bottom of this page.